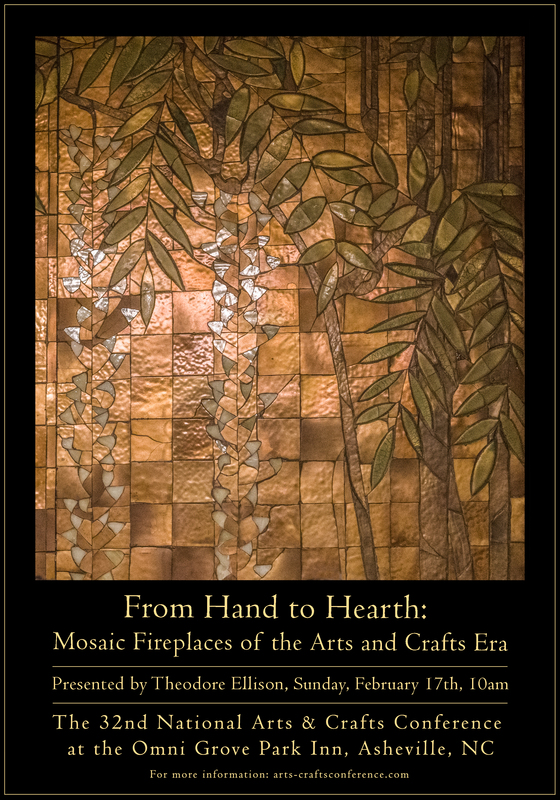 On Sunday, February 17th, I’ll be presenting my talk on the history of glass mosaic fireplaces as part of the 32nd National Arts & Crafts Conference at the Omni Grove Park Inn, in Asheville, NC. 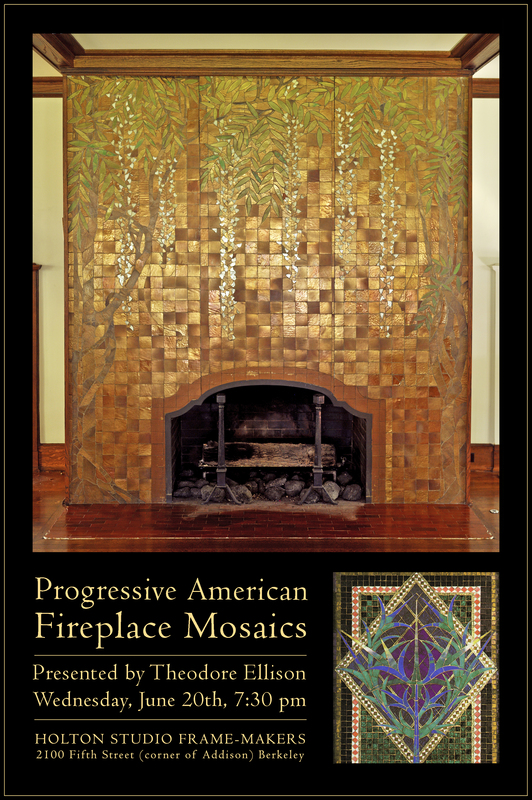 The art of glass mosaic design in the Arts & Crafts fireplace – especially in Prairie School homes – will be shown in this visual presentation. 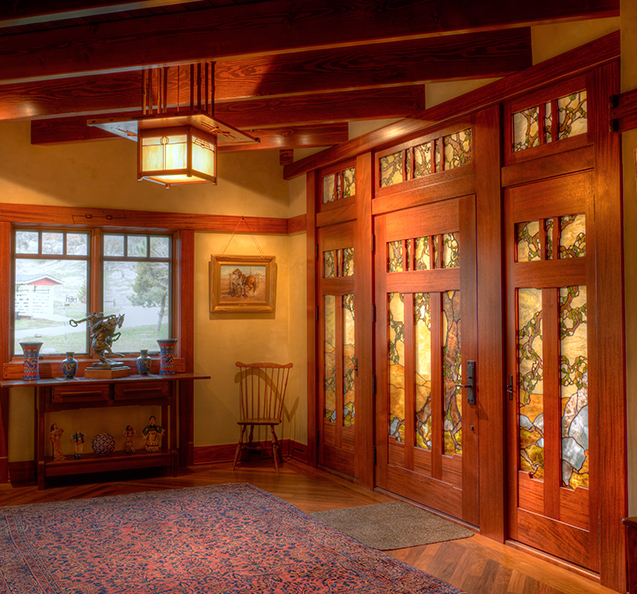 You’ll see color, beauty, and craftsmanship in the form of handcrafted fireplaces that shows how glass mosaics became important within the Arts & Crafts movement. More information here. When: Wednesday Evening, June 20th at 7:30 p.m. This illustrated talk will trace the introduction of mosaic in the buildings of progressive American architects around the turn of the twentieth century. Their collaboration with craftspeople created a new language for using mosaic in the home and provided a unique canvas for experimenting with new approaches to material and decorative design. These installations created nearly a century ago stand out as among the highest achievements of this once-ancient art form. 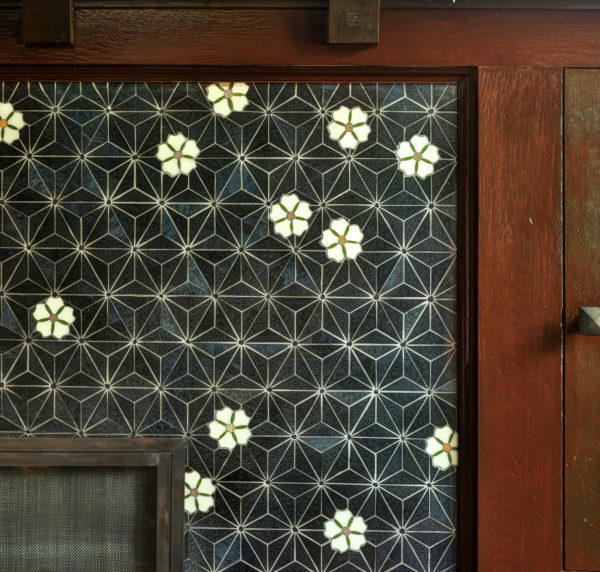 This glass fireplace mosaic was inspired by Sashiko, a Japanese embroidery technique using white cotton thread on indigo dyed fabric. 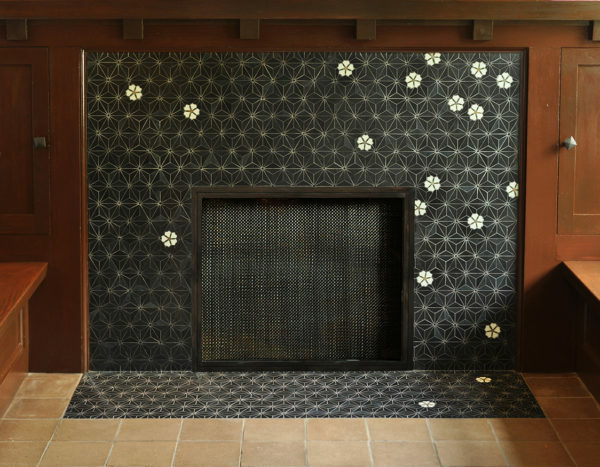 Sashiko was often used to reinforce and strengthen clothing and functional textiles to extend their utility, and it similarly suits this 100 year old house whose fireplace needed help. The original tile pavers were discolored and chipped and the client wanted something modern that would also suit the 100 year old Craftsman interior. We created the mosaic in our workshop and mounted it on two pieces of cement backboard for the face and hearth. We also made the fireplace screen. We used high-temperature magnets to hold the screen in place. Since this is a gas insert, access is rarely needed; the screen simply releases with a gentle pull from a handle milled into the underside of the top rail. The screen also obscures the less-than-convincing imitation logs. 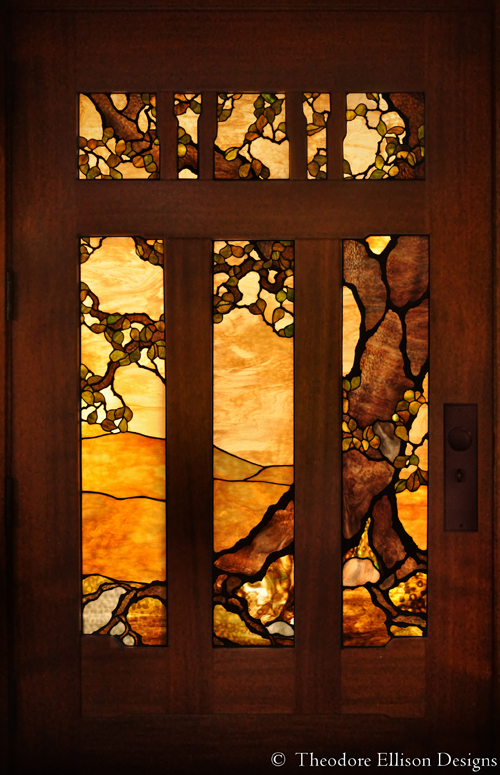 Traditional building guild Artistic License is hosting my illustrated talk, ‘The Stained Glass Art of Bruce Porter’, on Wednesday, March 1st @ 7pm at The Hillside Club, 2286 Cedar Street, Berkeley, CA. Bruce Porter (1865-1953) is perhaps most well-known for the windows at the Swedenborgian Church in San Francisco and the formal gardens he designed at Filoli. A true Renaissance man, he was at the center of Bay Area cultural life at the turn of the twentieth century. 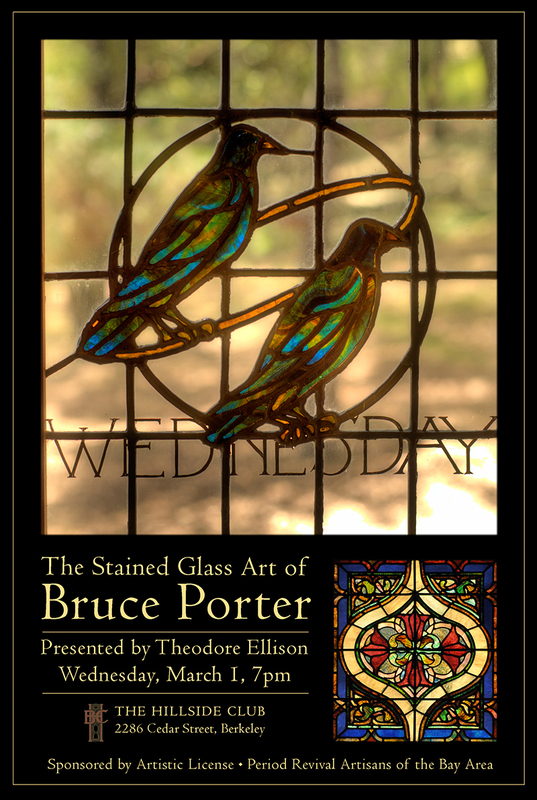 This talk will cover the artistry and timeline of Bruce Porter’s first career as a stained glass artist. Found in churches, private homes and exclusive clubs around California, this is a comprehensive look at Porter’s glasswork and will present the context and artistic influences that inspired his unique approach to the craft. Artistic License is a group of skilled professional artisans dedicated to historic architectural restoration and newly interpreted period design. Working in the tradition of historic artisan guilds, Artistic License members provide a wide range of services and products from architectural design and building restoration to period furnishings and fine finishes. I’ll be presenting a talk on Bruce Porter’s stained glass at Christ Church Coronado at a free, September 17 at 4:00 p.m. A reception will follow. Christ Church is located at the corner of Ninth Street and C Avenue. Parking is available in the church lot directly opposite the campus on C Avenue. For more information you can contact the parish office – 619-435-4561 or www.christchurchcoronado.org. 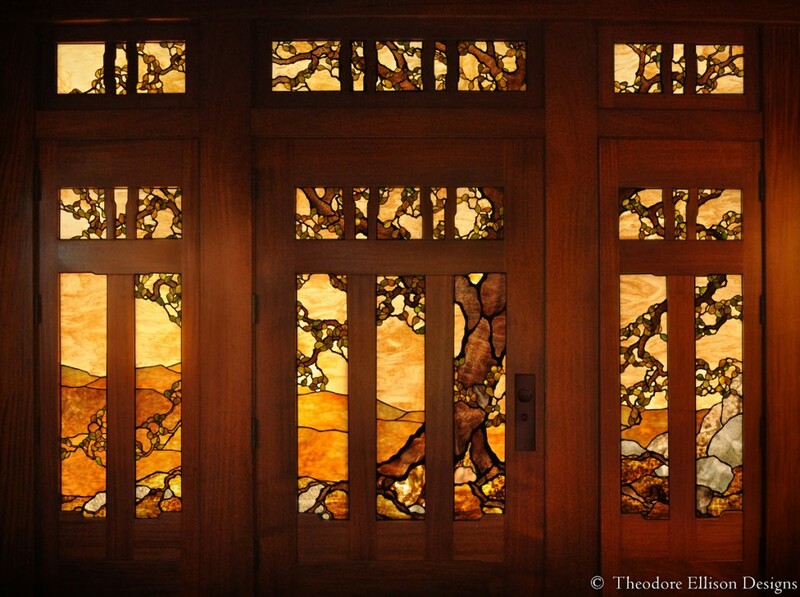 On Saturday, I’m giving a talk on the glass work of Bruce Porter, an artist, writer and designer of stained glass windows in San Francisco at the turn of the century. 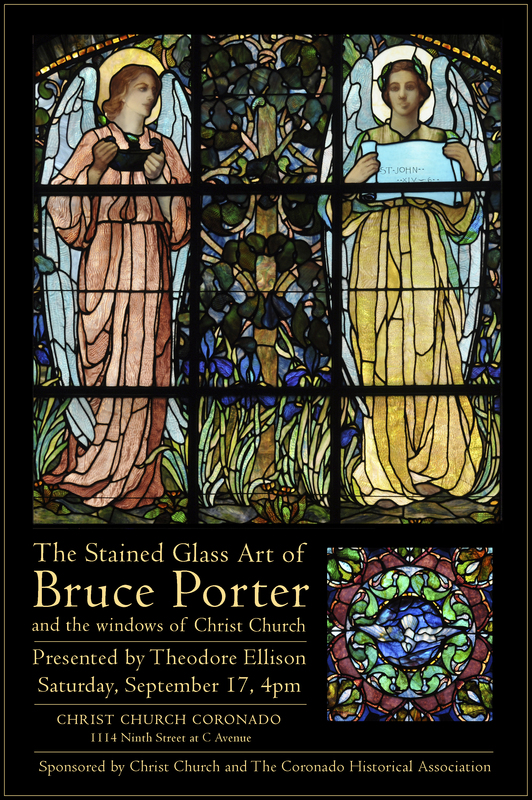 This talk will cover the artistry and timeline of Bruce Porter’s first career as a stained glass artist. Found in churches, private homes and exclusive clubs around California, this is a comprehensive look at Porter’s glasswork and will present the context and artistic influences that inspired his unique approach to the craft. Filmmaker Frazer Bradshaw did an excellent job on a short about my work. It shows the process from original idea to finished installation. Enjoy! 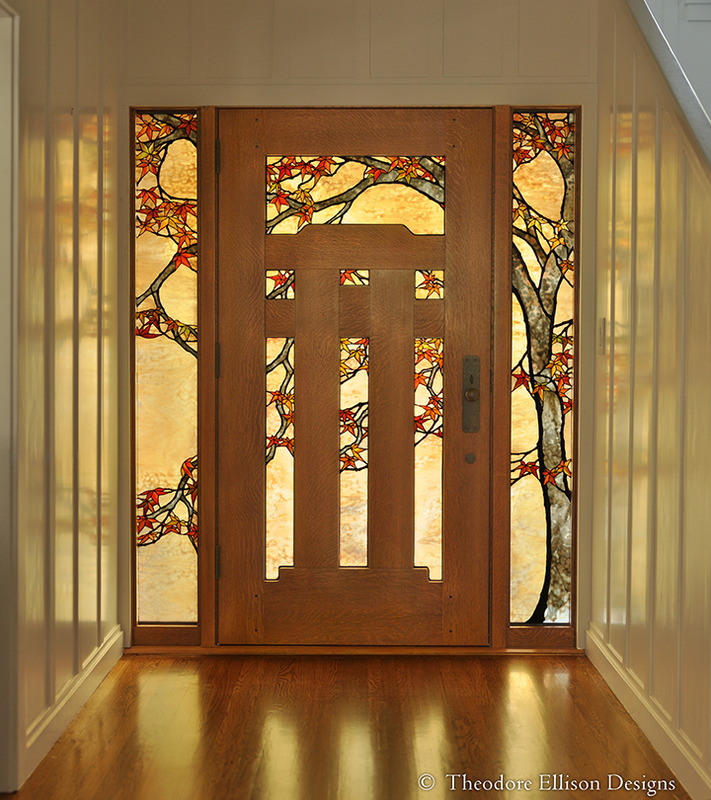 We recently installed these custom leaded glass panels into another one of Shawn Kammerer’s extremely well crafted doors. Check out his work here. 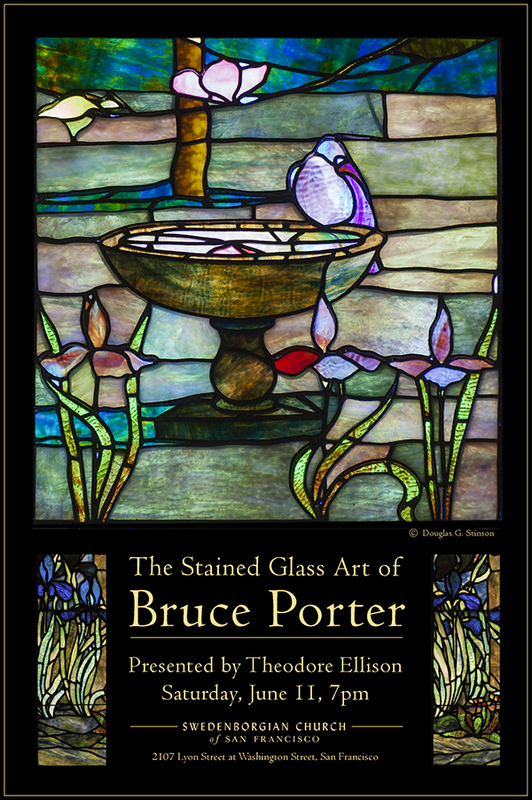 On Saturday, February 27th, I’m presenting a lecture on the glass work of Bruce Porter, an artist, writer and designer of stained glass windows in San Francisco at the turn of the century. This is the culmination of my years-long research project and I’m looking forward to sharing the story of his work, which is now nearly forgotten. 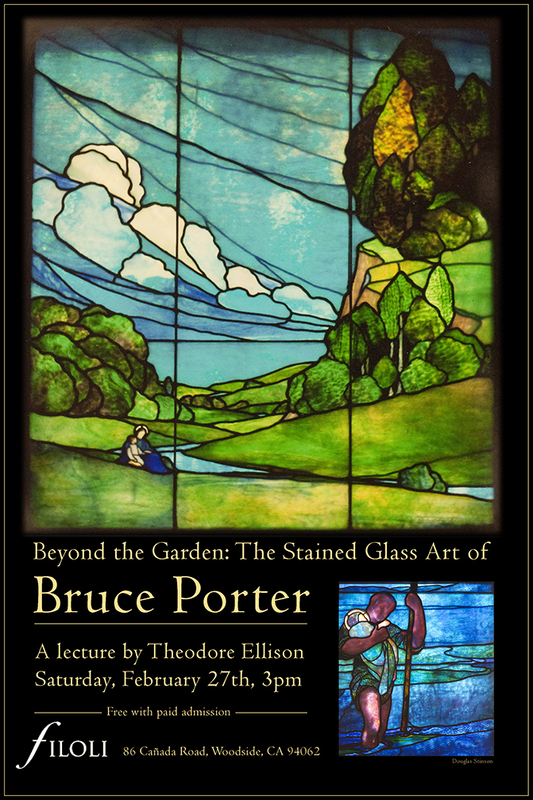 This lecture will cover the artistry and timeline of Bruce Porter’s first career as a stained glass artist. Found in churches, private homes and exclusive clubs around California, I’ve assembled the first-ever comprehensive look at Porter’s glasswork and will present the context and artistic influences that inspired his unique approach to the craft. This lecture coincides with an art exhibit from Filoli’s permanent collection : Beyond the Garden: Select Works by Bruce Porter. This project started with a visit to the site in Tehachapi, California. Walking the site with the client, it became clear that the subject of the window would be the old Oak trees that grew from rock out-croppings with a background inspired by the sweeping landscape of Central California.